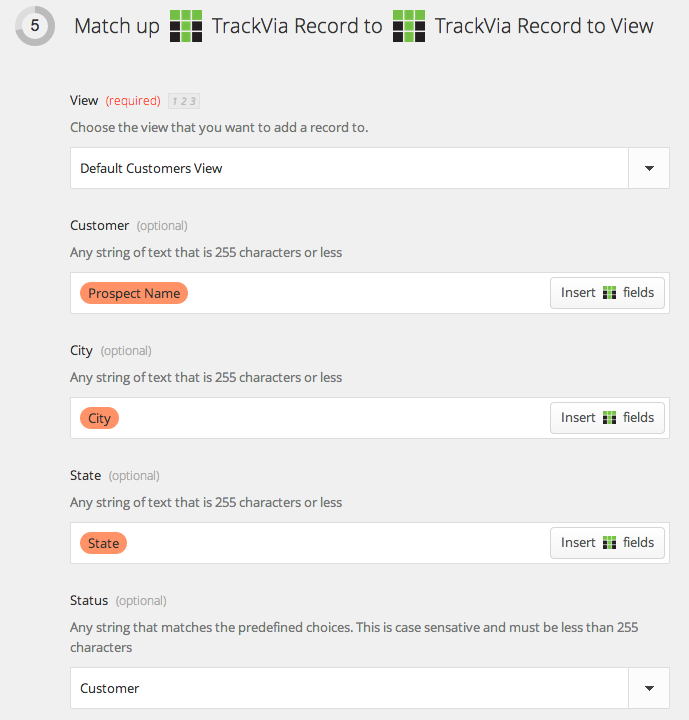 Although it may seem counterintuitive to connect TrackVia with itself, there are many use cases for doing so. For example, let's say we are tracking potential and existing customers, each of which are stored in their own tables, call them the Prospects and Customers tables. Wouldn't it be great if by switching a drop down field in your Prospects table from "Prospect" to "Customer", you could have that record automatically added to the Customers table? You can achieve this through a Zap (a connection between two apps that automates time-consuming tasks). Note: you can move information across apps as well. Once you have an account, you can click the 'Make a Zap!' button. You'll be prompted to choose your Trigger and Action Apps as well as what the trigger and action will be. Choose TrackVia for both apps. We will add a custom filter to move the data only when our Status field is changed to "Customer"
Test the Zap. This will check to see if your Zap is working properly and output examples so you can see your output. Once everything looks good, name your Zap and turn it on. Now let's go into our app and test it out by switching one of our prospects Status to "Customer". Once we switch, zapier will take over and automatically add the record to our customers table.